In providing assistance in this area, the Miller Engineering staff draws upon the writings and collections of historical materials from Dr. Miller’s 30+ years of experience. Part of our library, which consists of approximately 1,200 publications, is devoted to warnings and instructions alone. Four books on warnings have been written by our staff and associates. In addition to the 15+ years of forensic and research studies conducted by other senior staff at Miller Engineering, Dr. Miller’s experience has also resulted in an extensive historical library in the areas of human factors, ergonomics, product safety, occupational safety, machine guarding, government and consensus safety standards. Our library allows us to prepare both contemporary reports and state of the art analyses geared to a specific year a product was manufactured or sold. What does not exist in our library is researched and retrieved through our local and online access to the University of Michigan library system, as well as all of the customary Internet resources. Our research and design activities have resulted in numerous publications on a great variety of engineering topics. An extensive list of publications related to warnings can be found here. Some samples of our warnings-related work products can be found here. A number of models and numerous publications have been developed by Dr. Miller and Dr. Lehto to describe an orderly and reasonably rigorous methodology for researching, designing and testing warnings and other product information. Several of these appear in the following. The first is the Linear Sequence Determining Warnings Adequacy (left). It comes from our first Warnings Book: (Lehto, M.R. and Miller, J.M. (1986). 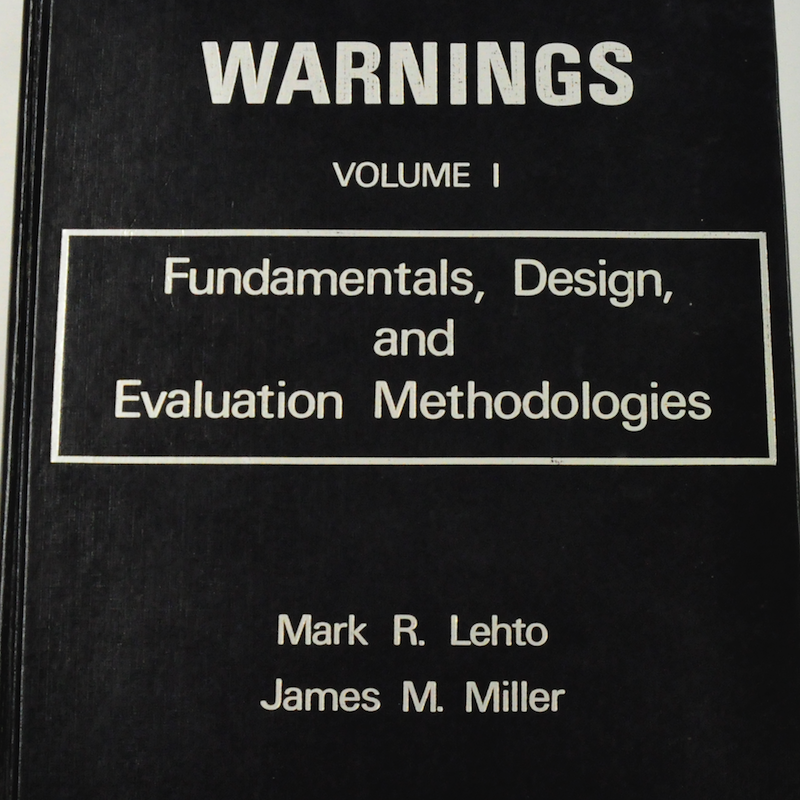 Warnings: Volume 1: Fundamentals, Design and Evaluation Methodologies. Ann Arbor, MI: Fuller Technical Publishing). Mark Lehto and Jim Miller have coauthored four books on the topic of warnings, instructions, and labeling. Their first book, Warnings: Volume 1: Fundamentals, Design and Evaluation Methodologies, may have been the first scholarly book totally devoted to the topic of warnings. A complimentary searchable form of this book is available here. Warnings and Safety Instructions: An Annotated Bibliography is in its fourth revision with 1,200 references. Books are available through Fuller Technical Publishing, 734-662-6822; FAX 734-747-9712.